Alongside the as-expected Nexus 6, Nexus 9 and Android Lollipop 5.0, Google has also showcased Nexus Player, a new, and first, Android TV powered set-top box that doubles up as a console allowing players to get their game on with the hundreds of thousands of titles available over at the Play Store. If you could picture a circular version of Apple TV, then that’s essentially what you’re getting right here. The tablet-like design – as in paracetamol as opposed to iPad – is certainly attractive, but it’s the wide range of features that really get us excited at the prospect of the Nexus Player. For example, it includes voice search via the supplied remote control, and by touching the mic button and uttering a couple of words, you can find the content you desire without the tedious rigmarole of endless browsing. The interface is very clean and to-the-point, and works a tad like some launchers on Android, in that it shuffles your content so that your favorite / most-accessed stuff is where you need it to be. Personalized recommendations also appear on your home screen as a matter of protocol, so in effect, you should always be able to find something to watch with little to no effort on your part. 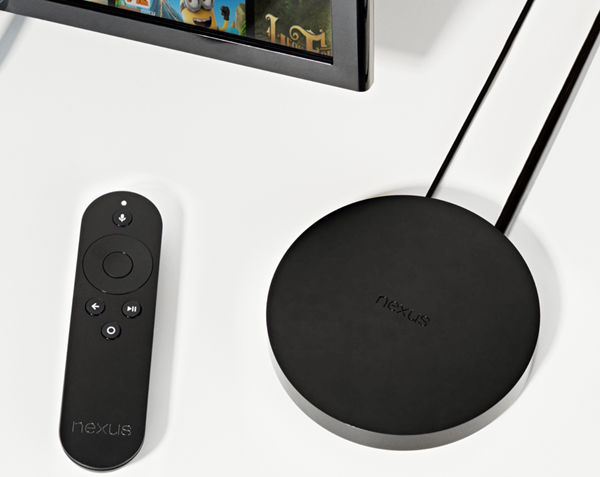 Nexus Player is also Google Cast-ready, so you can beam your favorite entertainment apps from a number of different devices and platforms. Nexus Player also includes a very Handoff-esque “Start here, finish there” feature. As Google describes in the product’s landing page, users will be able to, for example, begin watching a movie on Nexus Player before continuing on a tablet if they’re nodding off to sleep, and it’s the kind of functionality that once accustomed, would seemingly be hard to live without. The Nexus Player does offer a gaming controller, which is sold separately, although the remote control (and batteries) are included as standard. Gaming fans can enjoy online multiplayer, achievements, and all of the other perks found on regular Android, so essentially, it’s a larger-scale, traditional take on mobile gaming. For you numbers fanatics, the Nexus Player is powered by a 1.8GHz quad-core Intel Atom processor, and will connect wirelessly to your home’s Wi-Fi hotspot. The Nexus Player connects to your TV via HDMI, although the cable is not supplied, so you will need to pick one up if you don’t have a spare one lying around. 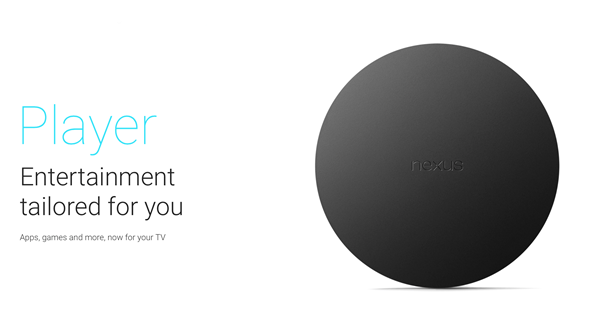 The Nexus Player will be available for pre-order starting October 17th, and will go on sale November 3rd. The Nexus Player will cost just $99, and considering what it has to offer, we’re betting that it might just give Apple TV a tough time. What are your first impressions of Nexus Player? 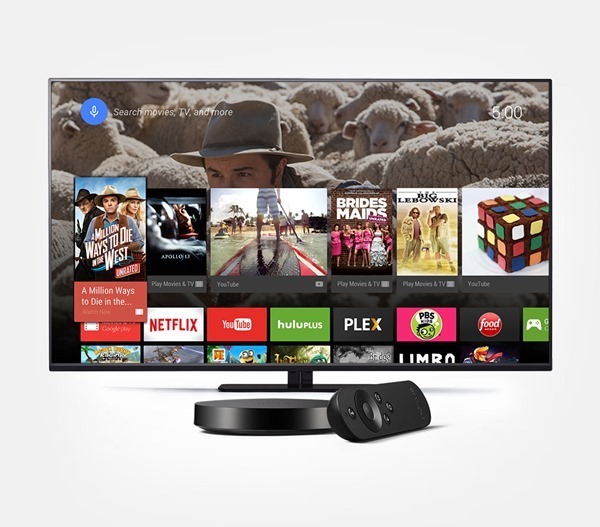 Looks like Google is finally pushing the right buttons for a TV device! I will be getting one for sure. The Apple TV will get demoted to just being an AirPlay target for video from my iDevices. Just another scam for Google to track and sell your viewing history. Forced ads will be next.. 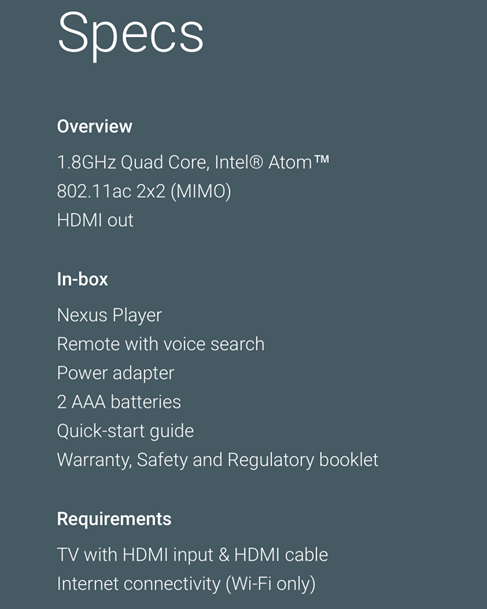 It has android, that’s all folks, just imagine all that games….man…Popcorn time and we are set done. I will buy one soon as it comes out. Like ASAP.